Moon photographed with a small 70mm refractor and a 4 Mpixel pocketcamera. 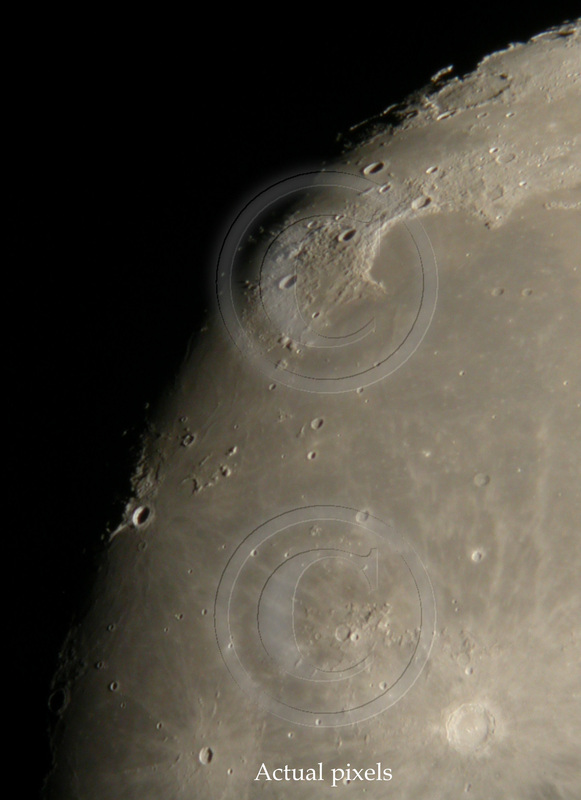 Main purpose is to post a comprehensive collection of lunar phases and - seeing permitting - some crater views. Images do not have any fixed magnification on these pages. Most of them have been cropped more or less randomly and later scaled to approximate size of 600x900 pixels. In these lunar phase pages samples of almost all archived nights have been posted. If seeing has been poor, only one or a few samples are included; under good seeing a larger collection may be shown. In each occasion seeing is printed on the first image. Seeing has been "estimated" only by deciding the sharpness of the images in scale 1-9 and 9 meaning the best possible seeing. *Seeing 4 or less means "hopeless night", but images have still been posted to cover all possible lunar phases better. 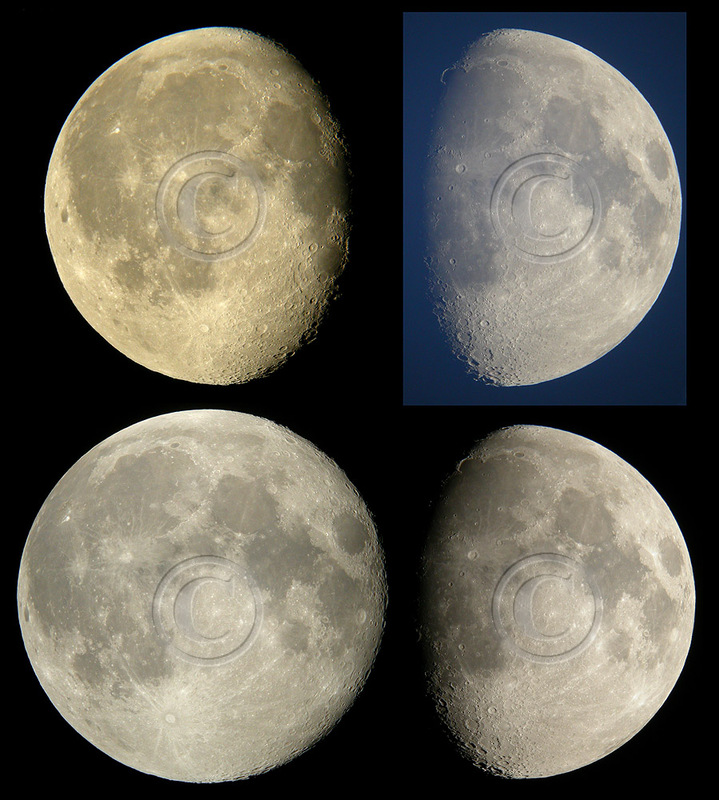 Normal phase image is not totally hopeless, but crater images are inevitably somewhat soft. *Normal seeing is about 5 meaning that there is no way to get a very sharp image no matter how many images are exposed. 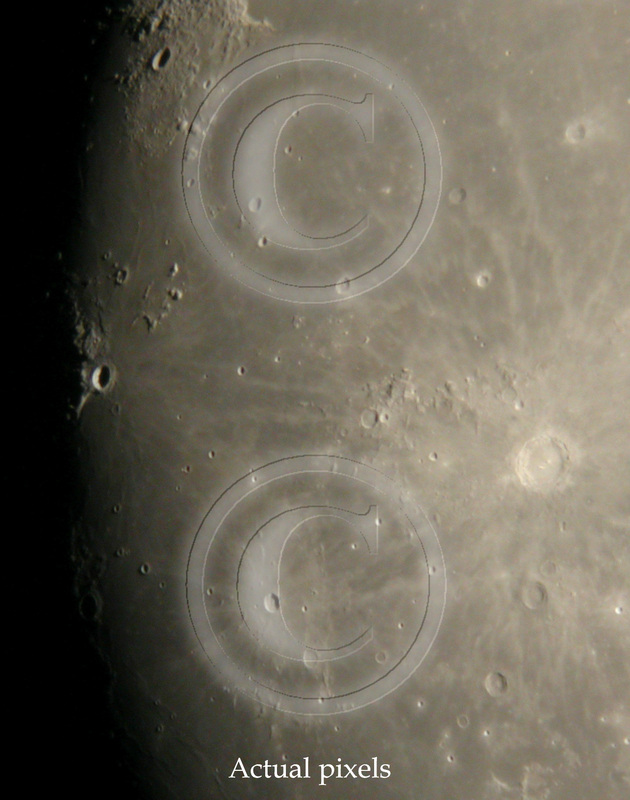 However, phase images are quite usable while magnified crater images show softness. *Seeing 6 means that exposing a lot it is possible to find some relatively sharp magnified crater images, but it is also evident that they are not yet the best possible. On some occasions these can be used to average 2 or more images to get a smoother look. *Seeing 7 or better means absense of almost all "high frequency" disturbance while smooth waves may still kindly distort the view. Below you find some examples. Each lunar phase is opened with one or two similair looking images. 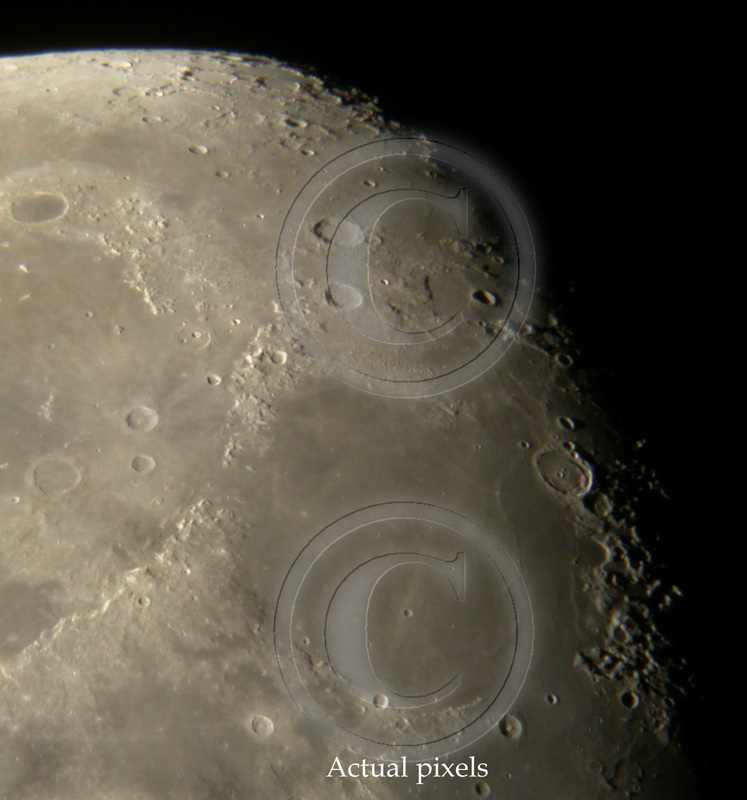 The first one is originally a single image where lunar diameter is somewhere between 1760-1930 pixels. The second one (it has letters "ISO" in the given name) has diameter somewhere around 5000 pixels and they have been composed of separate higher magnification images. Both images have a 100% sample (actual pixels shown) of the sharpness. Larger phase image is composed of 4 to 20 separate images stitched together using PhotoShop's tools to make distorted images to match. Distortion originates from the camera lens and the eyepiece. Composite images should not (!) have any too serious mismatches, but occasionally there seems to be some inaccuracy in the roundness of the lunar limb. 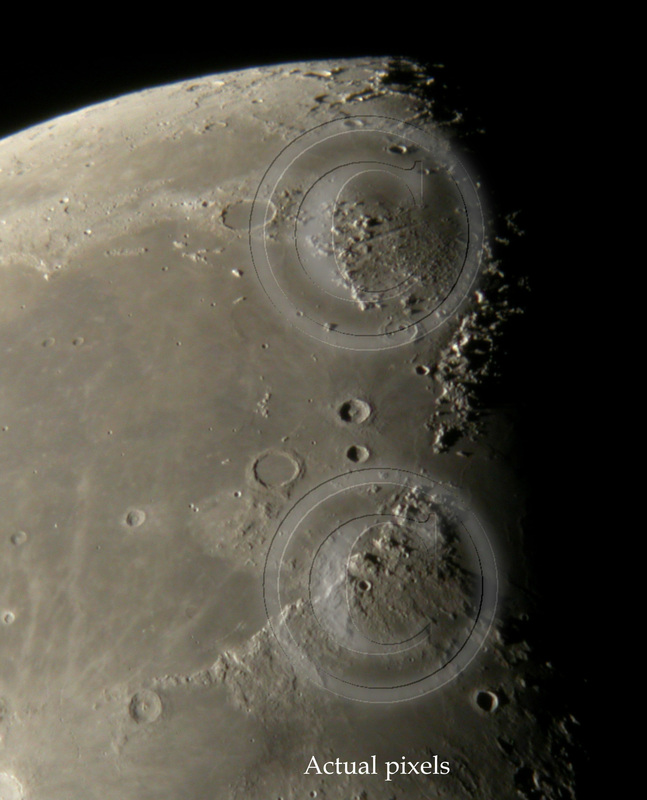 Pure phase images are usually followed by crater views from that particular night. These images are also the same which have been used to compose the large phase images above. They can be used to estimate the sharpness and resolution of the large phase image. 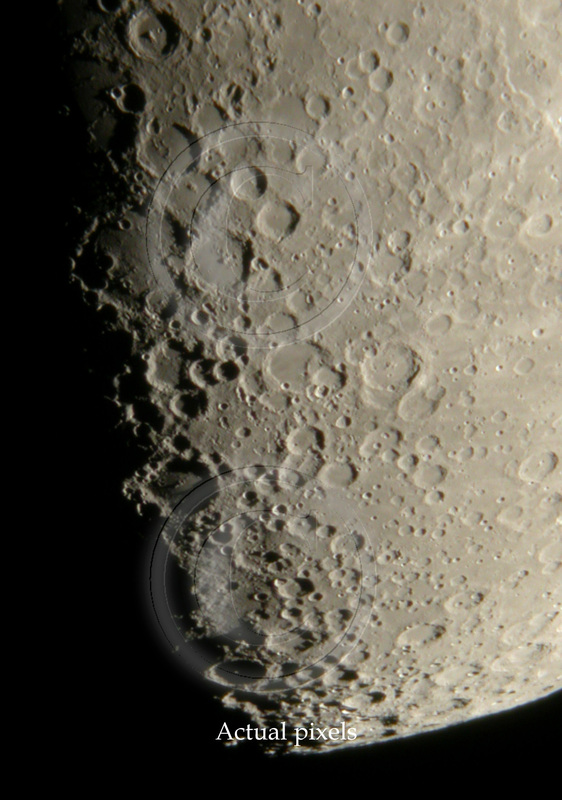 Crater images have their resolution typically close to 1700 x 2250 pixels. 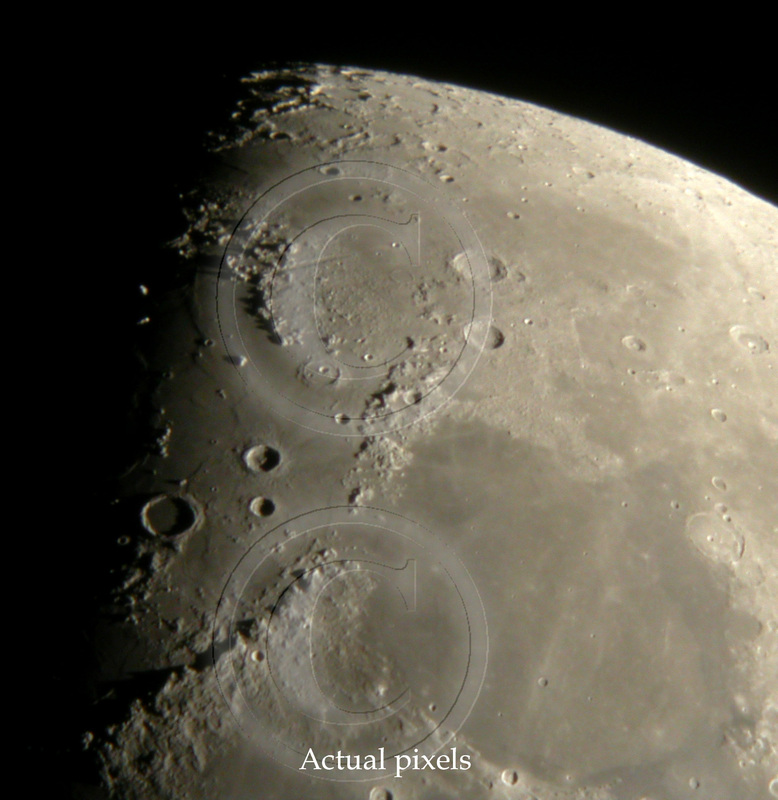 Finally, on some occasions "averaged" crater views are posted. These are images where 2-4 similair images have been averaged to diminish pixel artifacts; in general such images are a bit softer (seeing is never perfect and causes distortions) but on the other hand they are also smoother pixelwise. The reason to post this kind of "softer" images is to allow larger magnification with no JPG-artifacts. Averaged samples have been indicated with a printed notice on them. 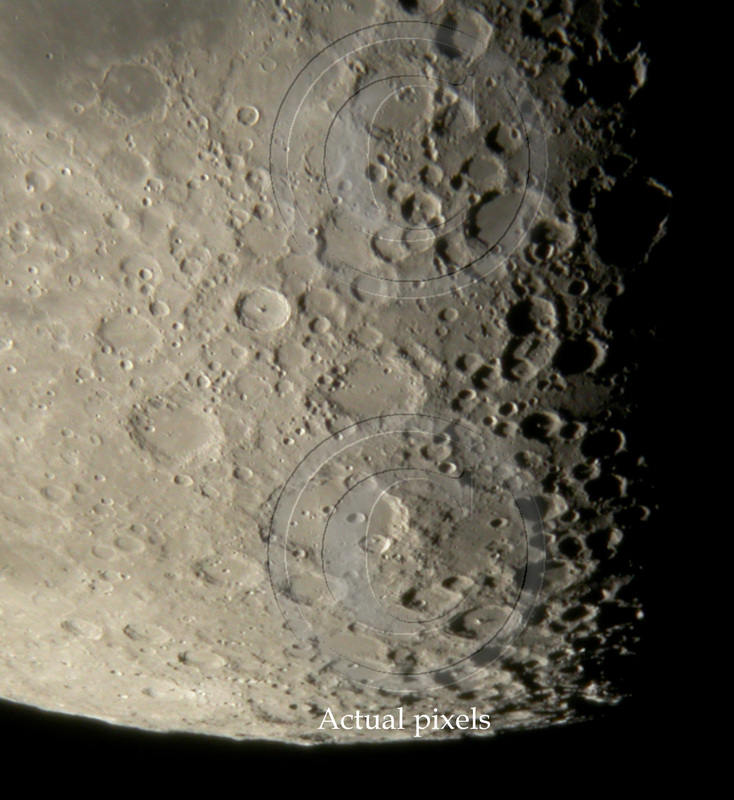 Due to these averaged images, there seems to be dublicate views of lunar surface. In general there is not much to gain in using 3 or more images to averaging compared to what is achieved by 2 image averaging. See samples below. Both images show actual pixels. 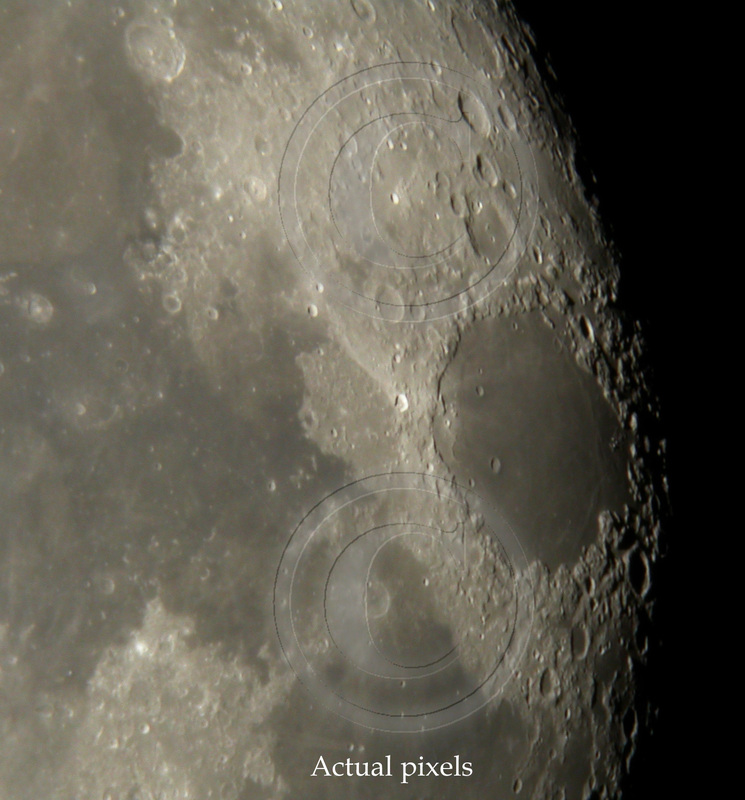 You surely notice different colors of lunar images. This is due to several factors. First of all the height of the moon affects on colors. A more pronounced difference is visible when the photography has been done in bright twillight; this gives a bluish tint to picture and especially it is visible as a darkblue-cyan tint on the terminator. Also air temperature affects: deep in subzero CCD-chip casts a magenta tint. Finally, when adjusting lightness and contrast color saturation will be affected considerably. In these pages colors have not been tuned to something "normal"; only the most disturbing effects have been corrected. Tuning - color, saturation, contrast and lightness - will be done more carefully if you place an order for some particular picture. Below you see some samples of original (not adjusted) images. Images have not been made too contrasty, although some details would jump out a lot better if this was done. Below you see original image and some higher contrast versions of it. This kind of contrast enchangement can be used in any image if appropriate.